"An easy and simple dish that is dressy enough for company or the holidays. It never fails to please guests but keeps your deli person busy with the waxed paper! The hardest part of this dish really is just wrapping the fish, which does not require any culinary skill whatsoever. Cod, sole, or similar white fish work equally well. Use dry sherry in place of white wine if desired." Combine mayonnaise, lemon juice, lemon zest, and garlic in a bowl; refrigerate for 15 to 30 minutes to blend flavors. Move an oven rack into the middle of oven and place another rack into top third; preheat oven to 400 degrees F (200 degrees C). Lay asparagus spears in a row onto a baking sheet and spray with cooking spray; sprinkle with sea salt. Drizzle haddock fillets with olive oil and sprinkle with black pepper and rosemary. Wrap each fillet loosely with 3 slices pancetta bacon, wrapping bacon so that ends meet over skinned side of fillets. 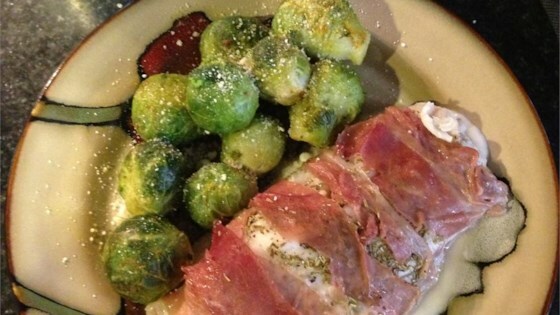 Place fillets into a 9x13-inch baking dish with bacon ends on the bottom. Pour white wine around the fillets. Place fish onto lower rack of preheated oven and bake for 7 minutes. Place asparagus onto upper rack of oven. Continue baking until pancetta is browned, fish is opaque and flakes easily, and asparagus are lightly browned on the tips, 7 to 8 more minutes. Stir warm water into lemon aioli sauce until sauce is pourable; pour about 2 tablespoons sauce onto each of 4 serving dishes. Arrange haddock fillets onto sauce and spread 1/4 of the roasted asparagus in a fan shape next to each fillet. When buying pancetta, have deli place waxed paper between slices. It is possible to keep the sauce on the side for persons to serve themselves, but you might want to increase the recipe of the aioli (people always serve themselves more than they need). I wasn't a huge fan of this. I'm glad I tested it out on myself before preparing it for my husband. It wasn't bad, it just seemed bland to me. I used bacon and it didn't get crispy. I tried to up the temp to 425 but it was still undercooked. The aioli sauce was very good. I will make this again but possibly cook the bacon first? This was absolutely delish! We loved it and will make it again soon!